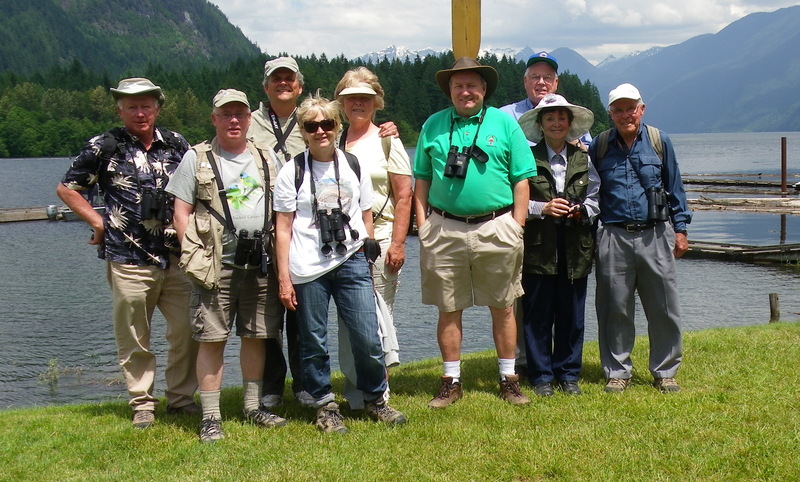 Nine participants (Rick & Marg, Roger & Mike, Lorna, Anne, first-timer John Whittaker, our local guru Larry Cowan and me) enjoyed a beautiful morning of birding at the Pitt Polder Park at Grant Narrows. Hi-lites including our “destination birds” were: Gray Catbird, American Redstart, Eastern Kingbird, Bullock’s Oriole, other “candy” Warblers and Lorna’s PB sandwich. Check out photos on our Picasa site at http://picasaweb.google.com/dncbirding. It took 1 ½ hours to drive to the Park via the new Golden Ears Bridge, but no problems, despite some rush hour traffic. We stopped at a pond just before the Grant Narrows parking lot which turned out to be very productive. A singing Gray Catbird welcomed us, and a colourful Black-headed Grosbeak posed and sang as well. Willow Flycatchers, Eastern Kingbirds, Common Yellowthroats took turns stopping in front of us for viewing. One of several Bullock’s Orioles seen during the day (fleetingly for some of us) also sang in a big Cottonwood. We had only been there for about 15 minutes and I suggested returning home since we had seen our Destination Birds. I was out-voted. Roger’s car finally arrived and as we continued on to the parking lot, they saw an American Bittern flying behind my SUV. Before starting on the well-cleared woodland trail, we enjoyed some nesting Barn Swallows at the concession stand taking turns feeding their young. We spent about an hour covering the first 100 yards of the trail. Very productive with beaut views of Yellow and Wilson’s Warblers, Warbling Vireos, lots of Cedar Waxwings, nesting Tree Swallows, Western Wood-Pewee (heard), plus more of the other species mentioned above that we saw on the road in. We met Len Jellicoe who showed us where he saw an American Redstart. We all finally saw a singing juvenile male, which kept flitting through the bushes, below a couple of Band-tailed Pigeons. As we walked further along, Canada Geese and about a dozen Wood Ducks were foraging in the ponds in the marsh, near a large Beaver lodge. Three Ospreys (resident nesters) caught our attention as they were hovering and diving into the ponds. Later we saw one Osprey circling with a fish in its claws. We heard several Swainson’s Thrushes, a Sora Rail and perhaps a Wilson’s Snipe, but could not locate them. A couple of Mute Swans were in the same spot we saw them last year. Near the Lookout, lots of Cliff Swallows were hawking insects and a pair of Eastern Kingbirds were on and near their nest in a stump in the water. Following lunch at the Lookout and Lorna’s delicious Peanut Butter sandwiches, the infamous, Lady Gaga-like Larry Cowan with his multi-jeweled attire, joined us for the walk back along the same trail to the entrance. He and Anne bonded and I lamented the ageless rookie John Whittaker not sharing his cookie with the leader. We saw the female American Redstart near where we saw the juvey male (are they breeding there? ), then took the obligatory Group Photo with the snow-covered mountains in the background. The sun roof and windows were open for the ride home which helped shelter me from the dulcet (not) tones of monotonous and inane (I like that word) chatter in the back seat. Another glorious outing of Casual Birding! Our Nats Booth was a hit at the Father’s Day Pancake Breakfast at Centennial Beach last Sunday. Don’t forget our Delta Nats Garden Party at Pam-Jen’s this Saturday. I will be at Petra’s next Wednesday, June 29 for departure at 7:30 a.m. on an outing “somewhere around the Bay”. C omments welcome, let me know if you want off my list (again?). This entry was posted in *DNCB, American Bittern, American Redstart, Band-tailed Pigeon, Bullock's Oriole, Cedar Waxwing, Cliff Swallow, Eastern Kingbird, Grant Narrows, Gray Catbird, Mute Swan, Osprey, Pitt Lake, Pitt-Addington Marsh WMA, Swainson's Thrush, Warbling Vireo, Western Wood-Pewee, Willow Flycatcher, Wilson’s Warbler, Yellow Warbler. Bookmark the permalink.